Summary: Project is to purchase a Boston Whaler, engine, and trailer in support of Mote Marine Laboratory's on-water rescues of sick, injured, or entangled sea turtles and recovery of dead floating turtles within our response area and elsewhere as requested by Florida Fish and Wildlife Conservation Commission. A vessel dedicated to the 24-hour response to stranded sea turtles will greatly enhance Mote Marine Laboratory's ability to respond efficiently and effectively. For live-stranded sea turtles, faster response will ultimately result in more humane care and allow SIP to be more independent in our response, thus alleviating local marine patrol (county and state) and members of the general public of that burden. For dead-stranded sea turtles, valuable data will be collected as SIP does thorough necropsies on all turtles recovered and those data are provided to FWCC. Results: The boat has been used on twelve occasions for sea turtle stranding response. On 6/24/2014, a dead loggerhead sea turtle with boat-strike wounds was recovered and a subsequent necropsy was performed. On 7/5/2014, a search for distressed sea turtle was conducted. After an extensive search the turtle was not located and the search was ended due to sunset. On 717/2014, a live Kemp's ridley sea turtle was recovered. The adult turtle was floating at the surface with boat-strike and entanglement wounds was admitted into Mote Marine Laboratory's Sea Turtle Rehabilitation Hospital and is currently still under our care. A dead loggerhead sea turtle entangled in a cast net was recovered near Longboat Pass in Sarasota Bay on 3117/2015. On 3118/2015, the boat was used on two separate occasions to recover a dead floating loggerhead sea turtle and a green sea turtle with both a boat strike and fishing gear attached. Both animals were floating in Sarasota Bay, near Longboat Pass. On 4/23/2015, a dead, boat-struck green sea turtle was recovered from the middle of Sarasota Bay. In addition to the recoveries listed above, the boat was used an additional five times from 61112015 through 9/112015. 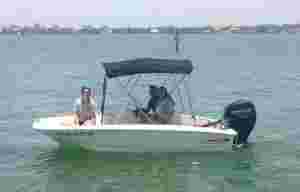 A carcass was reported floating in Manatee County, near Sister Keys in Sarasota Bay on 5/28/2015 and the boat was used to search the area, but we were unable to locate the carcass. On 7/612015, the boat was used on three separate occasions to recover dead, boat-struck turtles (one Kemp's ridley and two loggerhead sea turtles). On 8116/2015, we attempted to rescue a lethargic loggerhead sea turtle, but were unable to get on-scene. The turtle was brought to shore by law enforcement and transported it by truck to Mote Marine Laboratory's Sea Turtle Rehabilitation Hospital where it is still receiving care.